Superman lands on the moon and enters the JLA Watchtower. Entering through a pair of smashed doors, he finds the remains of what was once Shrapnel. One hour earlier, Superman confronts Luthor about the use of Suicide Squad. Waller and General Rock come right back at him with the information that they are at war, and the casulaties are mounting. Luthor tells Superman that he has been drafted, and that he must go to the moon. Superman continues through the tower. Opening a door he finds Chemo floating, gradually leaking his insides. He initiates the restoration of the artificial gravity and the villain begins drifting to the floor. He thinks back to the White House where General Rock told him of the army's forces that they have guarding the White House, and the Blackhawk Air Corps flying the state-of-the-art fighters. On the moon, Superman finds a decimated Mongul on the ground. Suddenly he hears a voice and whirls around to find Manchester Black standing in the shadows. Manchester tells Kal that they were sent up to let loose the 'Big Dog', and he had the worst temper that Black had ever encountered. Superman hears a moan and quickly rushes to the wounded's side. Steel sits on the ground, barely holding on to life. He tells Superman that it was his own choice to come up and free the beast. As Steel falls into unconsciousness, Manchester tells Superman that it was his job to plant an image of Imperiex in Doomsday's mind. Then after announcing that he has nullified the control fluid in his spine he heads to the teleports and disappears, destroying the tubes behind him. Superman heads out into space, calling down to Luthor that Steel needs immediate help. As he heads toward the alien armada, he thinks about the pain that Doomsday has caused him. Kal arrives on the scene in time to see Doomsday punch straight through a probe, severing its head. Superman dives through its chest and leaves the behemoth destroyed. The former hunter and prey combine forces to tear through the dozens of probes, destroying one after another. Superman then confronts the giant Imperiex Prime. The cosmic being looks on Superman with distaste. With a mere gesture, he blasts Doomsday, removing the skin from his bones and leaving the once-powerful killer a glowing skeleton in space. Superman is shocked as the being once again raises his hand and fires. Imperiex stands triumphant. Superman streaks across the heavens, a burning fireball, before coming to a crash landing on Apokalips. Story - 3: This story got the middle rating because the first half was good and the last half was pretty bad. I liked seeing Superman meet with Black again, and seeing a brief recap of America's forces was nice. It was also cool to see how badly Doomsday tore through the squad. However, the second half was pretty weak. The probes were much to easy to defeat. Superman and Doomsday took down more than a dozen probes in the time that it took Superman to take just the first one down. Plus, not a single one of them exploded with the devastating force that severely wounded Diana and killed Arthur. Doomsday didn't really accomplish much and this seemed like just a cheap gimmick to bring him back. Also, being the first confrontation between Superman and Imperiex Prime, it seemed kind of weak. I expected something more. Art - 4: I'm still not sure what to think of this art. On one hand it is very dynamic and clean, but on the other it lacks a lot of detail and is sometimes too cartoony. 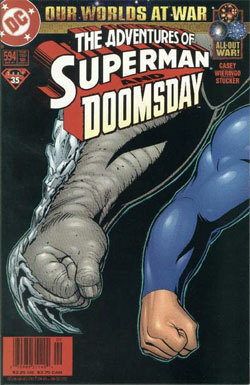 In this issue especially, the style annoyed me because Doomsday looked much too animated. If there is one creature that is supposed to look a certain way it's him. Jurgens did a great Doomsday and (I can't believe I'm actually saying this) Bogdanove also did a good Doomsday, but the symmetrical Doomsday that we got in this issue lacked the normal look that Doomsday needs to have. Other than that Superman looked good, as did everyone else (except for Manchester, but that's just a minor point). I like Wieringo, I'm just not sure how much. Cover Art - 2: The art's not bad, and the general idea of Superman and Doomsday teamed up is a good concept, but the cover ended up being horrible. A cover needs to be eye-catching. A boring arm shot is not exciting. Also, a black background with nothing in it does not pass for a cover. It tells what's in the issue, but certainly isn't going to attract any attention, and that's what a cover is for.